Fiction – Kindle edition; Faber & Faber; 320 pages; 2013. 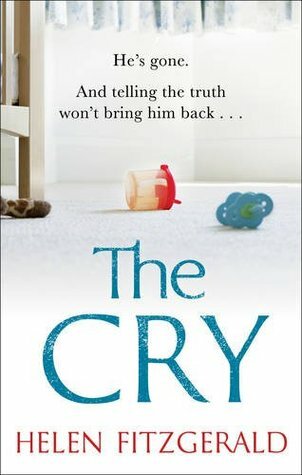 I love novels that feature morally dubious characters — and Helen FitzGerald‘s latest novel, The Cry, slots very nicely into that category. I’ve read a couple of Fitzgerald’s novels before — Dead Lovely (2007) and My Last Confession (2009) — and both were edgy, entertaining reads featuring well-meaning people behaving in abhorrent ways. The Cry is cut from the same cloth. Joanna is a first-time mother from Glasgow, bound for Australia with Alistair — the father of her child — a high-powered spin doctor for the British Labour Party. But the flight to Melbourne, via Dubai, is traumatic: nine-week-old Noah cries the whole way and won’t settle. Joanna, who is suffering from an ear-infection, is frazzled and ill-tempered. But then Alistair steps in and offers to nurse the child, so that Joanna can finally get some much-needed rest. When the trio eventually arrive in Australia, Noah is fast asleep. They dare not wake him, and decide to drive straight to Alistair’s mum’s place, in Geelong, despite the fact that it’s bushfire season and the sky is awash with ash and black smoke. But on the car journey Joanna makes a fateful discovery: Noah is not asleep — he’s dead. What happens next is a heart-hammering psychological ride in which one bad decision follows another, because instead of going to the police or calling an ambulance, Alistair decides to engineer Noah’s disappearance from a roadside petrol station. And because truth is often stranger than fiction — how many parents do we see on the news protesting their innocence, only to be arrested for murder at a later date? — the storyline never seems over the top even though Alistair’s actions are repugnant. Indeed, the entire plot seems incredibly believable — and current. It is also very fast moving. FitzGerald keeps the momentum up in several clever ways: she makes grief-stricken Joanna want to confess to the crime, so the reader is constantly wondering, will she or won’t she; she provides an interesting back story in the form of Alistair’s ex-wife, who is fighting over the custody of their teenage daughter and may possibly be framed for Noah’s murder; and she tells the story from multiple viewpoints and intercuts it with short scenes from the resulting court case. I read the entire book in three sittings, eager to get to the end so that I could find out what happened next. And while it’s not a completely satisfying read — the climax, which has a neat little twist, didn’t seem convincing to me — it’s a thoroughly good psychological-type drama, perfect for those who like stories that explore why normally good people end up doing bad things. Sounds good–the sticky point in the telling of the tale would be when the parents cook up the plot. I mean, it’s a huge leap from having a dead child to cooking up a story re: disappearance. We know that people have done it, but the author, in this context, has to make the parents’ actions make sense to them at the time (even if we know it’s a crazy plan fraught with problems). Did the author manage to carry off this part of the plot? Thanks for your comment, Bernadette, and for tweeting my review, too. I really enjoyed this book — and for 99p on Kindle it was the bargain of the century! The parents’ actions make complete sense… we learn very early on that the pair have dubious morals because their relationship began as an affair. We also know that Joanna doesn’t have much of a backbone and will just go along with things — she never really stands up for herself in any facet of her life. And we know Alistair is dodgy because he got his lover pregnant while happily married to someone else. Plus, his skills as a spin doctor really come into play — he specialises in getting British politicians out of disasters, so he knows how to manipulate the media and “bend” events to his advantage. He uses all those skills to cook up Noah’s disappearance. So yes, the author did carry this off very well — it seemed totally believable. If Amanda likes crime with a psychological edge and firmly rooted in reality, she may well love this, Stu. It’s a quick read, too. I can imagine getting to the point where they decide that the best thing to do is to try and cover up the death and shouting at them not to be so stupid! It’s inconceivable that they would do such a thing and yet when you read true life stories you realise its not that much beyond the boundaries of possibility. I thought this was a cracking read too, I bought it on holiday and raced through it as you did.